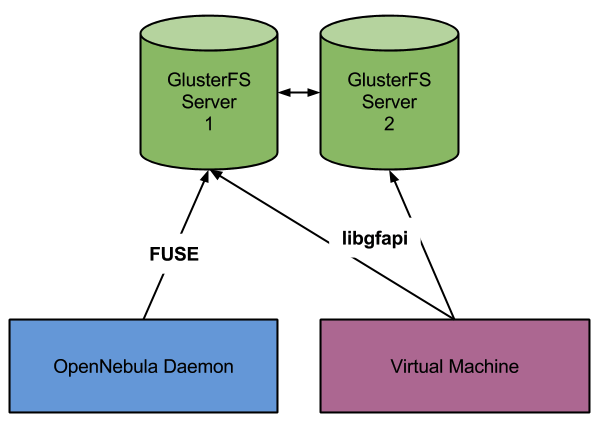 GlusterFS is a distributed filesystem with replica and storage distribution features that come really handy for virtualization. This storage can be mounted as a filesystem using NFS or FUSE adapter for GlusterFS and is used as any other shared filesystem. This way of using it is very convenient as it works the same way as other filesystems, still it has the overhead of NFS or FUSE. The good news is that for some time now qemu and libvirt have native support for GlusterFS. This makes possible for VMs running from images stored in Gluster to talk directly with its servers making the IO much faster. The integration was made to be as similar as possible to the shared drivers (in fact uses shared tm and fs datastore drivers). Datastore management like image registration or cloning still use FUSE mounted filesystem so OpenNebula administrators will feel at home with it. This feature is headed for 4.6 and is already in the git repository and the documentation. Basically the configuration to use this integration is as follows. Now when you start a new VM you can check that in the deployment file it points to the server configured in the datastore. Another nice feature is that storage will fall back to a secondary server in case one of them crashes. The information about replicas is automatically gathered, there is no need to add more than one host (and is currently not supported in libvirt). If you are interested in this feature it’s a good time to download and compile master branch to test this feature. There is still some time until a release candidate of 4.6 comes out but we’d love to have some feedback as soon as possible to fix any problems that it may have. We want to thank Netways people for helping us with this integration and testing of the qemu/gluster interface, and to John Mark from the Gluster team for his technical assistance. My bad. I’ve just changed the post. Thanks for telling us. Subsequently it’s the same for the uid as well. That messed me up as well.